Remove the breasts from two ducks; roast the rest of the bird for stock or additional meat to serve with the wraps. If you are using prepared breasts, go to step 2. Fry the duck breasts with chopped garlic, ginger and chilli. Add a couple of dashes of soy sauce and the juice of half a lime, cook duck breasts till rare. Remove breasts from the pan and allow to cool. Add a couple of handfuls of spinach to the pan and fry, add a couple more dashes of soy sauce to help the spinach wilt. Remove and allow to cool. 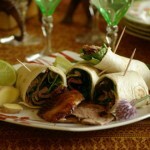 Slice the duck breast and roll with spinach into the tortilla wrap and serve.